Item # 142853 Stash Points: 9,499 (?) This is the number of points you get in The Zumiez Stash for purchasing this item. Stash points are redeemable for exclusive rewards only available to Zumiez Stash members. To redeem your points check out the rewards catalog on thestash.zumiez.com. 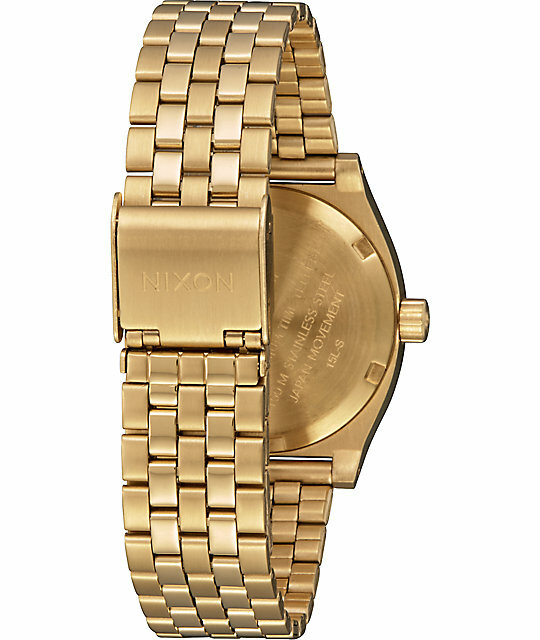 Made with a slightly smaller design than the classic Time Teller silhouette, the All Gold Medium Time Teller watch from Nixon is perfect for any wrist size. 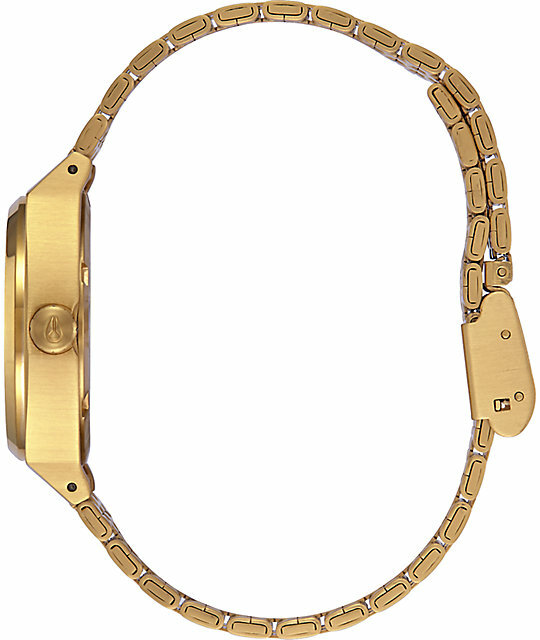 The gold colored stainless steel 31mm case and 5-link tapered band will add luxe styling to any outfit, and can be dressed up or down for a personalized look. 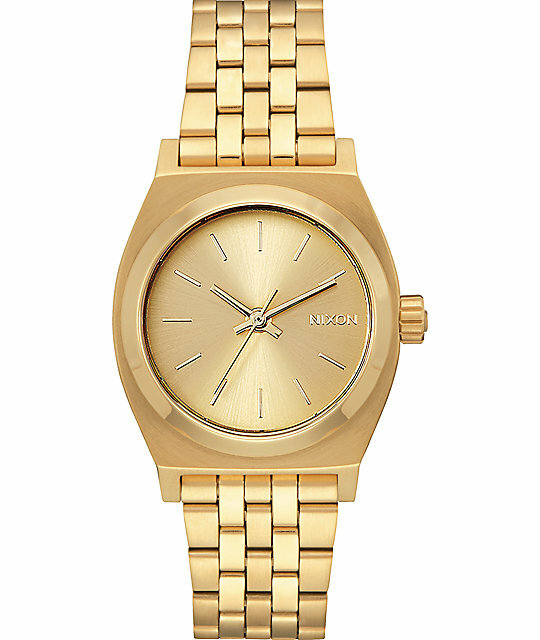 Additional features include a Miyota Japanese Quartz 3 hand movement with custom molded hands and applied indices. 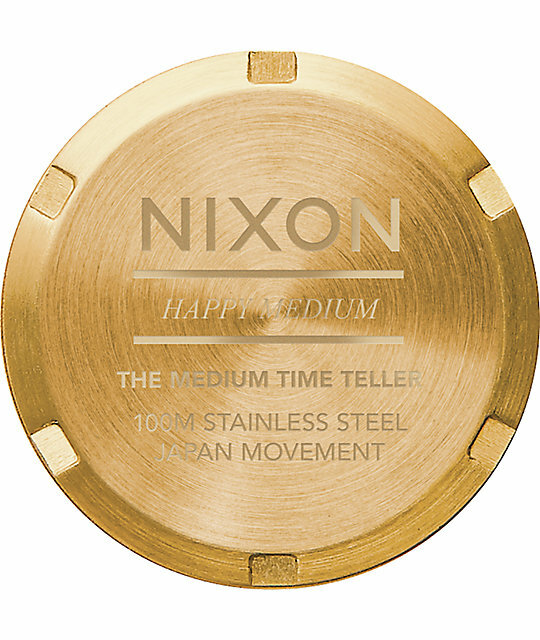 Medium Time Teller analog watch by Nixon. 31mm stainless steel case with hardened mineral crystal display. 100 meter/10 ATM water resistance. Miyota Japanese quartz 3 hand movement. Triple gasket stainless steel crown at the 3 o'clock hour. Stainless steel screw down caseback and spring pin lugs. 16mm tapered canvas and genuine leather band. Stainless steel locking buckle for a secure fit. 2-year manufacturer's limited warranty of defects in materials and workmanship.